FREE Workshops available for women & young women! Home » FREE Workshops available for women & young women! Do you want to find out more about a variety of topics that are relevant to, and affect women and girls? Are you part of, or do you run, a group for girls, young women or women? Are you looking to increase your knowledge about topics such as healthy relationships, self-esteem, confidence building, internet safety, emotional wellbeing, being a woman or girl in Leeds, and more? 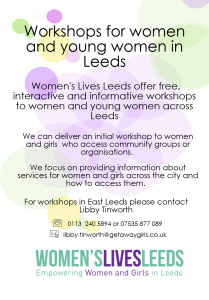 We offer free, interactive and informative workshops for girls, young women and women across Leeds. Workshops are available to community groups, education providers and organisations that work with women and girls. We can cover a range of topics (those listed above and more!) The workshops can focus on a range of topics over a 4-6 week period, or it can just be a one off workshop covering a single topic that is relevant to your group. Our experienced Community Development Workers can come and deliver these fun and engaging workshops for you, your staff and service users for free!